People With More Money Save More - Fact or Myth? On average, people with more money save more. Do the Rich Save More? Does Wealth Affect the Propensity to Save? Factor in the fact that the rich profit off of interest on debt (they are the one’s extending the credit), and factor in the fact that the rate of return on capital tends to outpace economic growth (thus increasing the gap between capital and labor and rich and poor), and you can see how this leads to an ever-increasing wealth gap over time (see economic inequality explainer here). This information can be gleaned by looking at taxes paid in any recent year (example), by looking at credit/debt habits (example), by looking at past studies (example), and by using general logic. Is the Fact that “The Rich Save More” a Problem? Should We Address it, and if so How? We know when people save more than they spend, on average, it slows the economy by decreasing the velocity of money (which can only be remedied with increasing spending, increasing taxation, or increasing the money supply). Given this, we can conclude that addressing income and wealth inequality would have a direct effect on economic health and growth (for example taxing the top .01%’s wealth would allow us to pay down the debt, or the top .01% electing to spend their money would increase the velocity of money; both offset the need for increasing the money supply to rapidly). With the above said, simple answers are not as simple as they seem. The problem lies in details, such as the fact that too much hoarding and too much spending can both cause economic problems like inflation or worse. Tax the 1% too heavily, and they move to another nation or move their money to a shadow bank. Force the 1% to spend money, and that is despotism. Incentivize the rich to spend, and that likely means creating more debt. Force the 80% to stop living beyond their means and taking NINA loans, and the economy suffers from a lack of demand (and thus the velocity of money slows). Incentivize the rich to spend and poor to save, and yes that would be good fiscal policy, but politicians rarely want to tighten the belt on their watch. Change interest rates and affect monetary policy, and that could work, but rates are already near zero (changing rates, that is kind of what the whole FED thing is about… and our current monetary policy isn’t exactly solving the problem alone). Create a global wealth tax and redistribute it to the poor, well that could work, but good luck implementing even a slight form of global socialism (and if you do, good luck ensuring it stays well-managed and useful). In other words, there are lots of solutions, but each one is a complex trade-off. Thus, the general problem is easy to see, the rich save more and thus the wealth gap grows over time, but a smart solution is VERY hard to come by (especially with special interests and ideological stances on socialism and the free-market considered). We explore all these ideas below to help illustrate the above truisms. FACT: The income gap describes differences in income, but the income gap is only a small part of the problem. The problem is the wealth gap over time. Wealth consolidates in fewer-and-fewer families over time (as wealth is passed on to new generations), and businesses tend to consolidate assets as well (through mergers, buyouts, stock holding, etc; see “the Consolidation Curve“). Lower taxes on long-term capital gains, a lack of estate taxes, the fact the rate of return on capital outpaces economic growth, and the fact that many with lower-incomes live partly off of debt contribute to the overarching problem. Many factors pertaining to the wealth gap are explained by Thomas Piketty’s Capital in the Twenty-First Century (see the citations below for other studies). The Velocity of Money Explained in One Minute. Income and Wealth Inequality: Crash Course Economics. FACT: Generally, the more money a person makes, the more they save and the less they make the less they save and the more credit they use (it is slightly more complex than this as some of the poorest don’t utilize credit; see Average Credit Card debt for examples). The recent wealth gap becomes more and more extreme the closer you get to the top. The .1% have both earned (income) and saved (wealth) the most of any group. What is So Wrong With Saving Money? The biggest problem is that, while saving money as an individual is good, saving money as a collective slows the economy due to factors like “the velocity of money“. Saving money as a collective leads to many complicated and hard to answer questions, especially when a majority of a nation isn’t saving but instead increasingly becoming indebted to the savers. See also: Why Do the Rich Save So Much? What is Inflation?. The questions surrounding inequality might appear new, but they aren’t. Here is a history lesson by the amazing “The School of Life“. FACT: On average, people with the most money save the most, while those with the least amount of money are more likely to spend most, if not all of their income. This is especially true when taking subsidies into account. And this is even more true when considering other factors like the national debt, interest payments, and the appreciating value of assets like stocks (not to mention lower tax rates on this sort of capital). The poor are also more likely to exceed their income limits by using credit. This is what is actually happening with Federal Taxes. Source: Tax Policy Center Table T16-0092 and Table T16-0077. 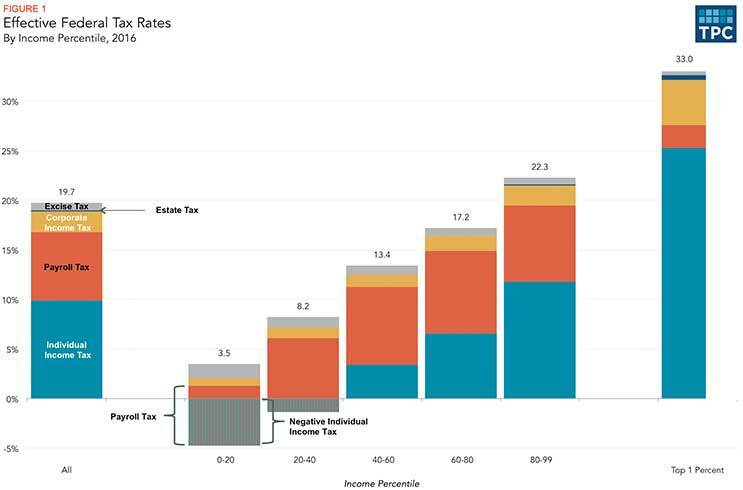 As you can see, the bottom 50% of Americans aren’t even making enough income to pay an effective tax rate. All we have to do is start calculating effects over time to see a whole slew of inpending problems. How does investment income affect things? Do spending habits change with age? Does sudden wealth affect someone different than steady wealth? Will addressing income inequality fix things, or is the issue more about tax loopholes and addressing tax havens like those exposed by the Panama Papers? How is wealth inequality different than income inequality? Are we talking about assets and stocks, or just dollar bills? Are we talking about job creation and wasteful spending? Are we looking at earnings in a year, income in a lifetime, or dollars spent in a day? What does this all mean for the health of the economy and nations over time? Furthermore, all things considered, what is fair and what exactly should be done about it? No one should be able to answer any of the above questions without a lot of critical thinking. The issues are complex; our perceptions can lead us to misunderstand the problem. Also, the few studies which have looked at these problems have not resulted in definitive results. Welcome to wealth and income inequality; idealism versus reality. Wealth Inequality in America, does the perception line up with the reality? The Truth about the term “1%”: This isn’t something most people would think about, but the 1% is a microcosm of the 100%. Within the 1%, there is a significant gap in wealth and income. The 1% includes millionaires, multi-millionaires, billionaires, and multi-billionaires. What is the difference between 1 million and 100 billion? The answer is 99.99 billion. The 1% includes Sean Penn, CEOs of non-profits, Mark Zuckerberg, David Koch, Bill Gates, investors, the Walton’s, NFL players, the woman who is two years into her startup, and the families out of the public eye. The 1% includes many tiers of income, wealth, ethos, virtue, debt, job creation, and control over the economy, culture, and politics. Some love their offshore accounts, some put all their money in charities, often even two family members are wildly different when it comes to thrift versus spend habits. Beware painting this “1%” with too broad a brush. As noted above, many people have misconceptions of who “the rich” are and how wealth is distributed. These issues need to be defined and addressed before we can understand how wealth impacts spending and saving. Different factors related to wealth and income have different effects on savings. “The 1%” in America is by definition 3.2 million people with very different incomes, wealth, and spending/saving habits. Consider, a girl who worked hard at her startup and made $1 million this year for her first and only year of profit. Now compare that to the grandchild of a wealthy investor who makes $1 million a year in a fund. They are both the top 1% of income, but only the grandchild has 1% of the wealth. Over time, if nothing changes, the girl will fall out of the 1% while the grandchild’s wealth will continue to grow. Both, Ted in accounting and Bill Gates are in the top 1% of wealthy people. This is because Ted makes $300,000 a year and has lived with his mother for the past 40 years while Bill Gates can’t spend his money fast enough due investment income and paychecks. What happens if we tax each estate equally? Is that fair? Compare the great-grandson of the world’s richest man, Kanye West, a lottery winner, a small business owner who made $500,000 in profit this year, or a first year NBA player. Whose money is it that is causing what problems? What is a fair and ideal distribution over time? TIP: Learn more about wealth and income inequality. Wealth Inequality in America? So we know the rich save more, but the problem comes when we realize there is more than one kind of wealth, and each has unique effects on the economy. TIP: This video mentions Capital in the Twenty-First Century by Thomas Piketty (affiliate link) about wealth income inequality versus income inequality. For more broad reading see “Who Will Own the Robots” (a look at potential future bias, and solutions, in the age of Artificial Intelligence). FACT: The Thrift Paradox describes the paradox that while individuals saving money is usually good, collective hoarding is frequently bad. Those subject to “composition bias” might assume that since saving money as an individual is good, then saving money as an economy is good, but this is a false assumption (AKA a fallacy). Learn about the Paradox of Thrift. The “Do the Rich Save More” Debate. I.E. Do Income and Wealth Inequality Lead to Hoarding and Slow the Velocity of Money Causing Recession and Deflation? What is Velocity of Money? This video explains how “saving” can lead to “recession” in everyday language. The underlying concept is called “the velocity of money” and is a critical concept. Reagan and his team thought they solved the above problems with “trickle down,” the rich get more money and thus create more jobs, but that didn’t work given the lack of regulation and incentives. So now we go back to the drawing board. Does “trickle up” work? Does the actual problem lie in the banking mortgage crisis and trading weather futures, or are we missing some important psychology? Does age affect savings? Do the rich have other ancillary benefits that aren’t as clear cut? How different is income from wealth in regards to the overarching problem? Is inter-generational wealth a separate issue? The answer to all those questions are, “yes, but…”. Thus, this problem is deceivingly difficult. Bernie Sanders gets endorsement from the most unlikely person. The video containing the above Asher Edelman quote. TIP: Under a flat tax rate of 95% the rich would get richer, and everyone else would be equally poor. A progressive tax has a similar effect; people can amass a little wealth at the bottom, but the rich stay rich. 0% flat tax has same affect. If we have just an estate tax, we stop intergenerational wealth, but is that fair? Anyone who comes at you with a simple blanket solution isn’t giving you the whole story. Watch out for being someone’s “useful idiot“. The problem with the concept that “the rich save more” (i.e. hoard the money and slow the economy), is that it sounds good to laymen, but is simplified. An economist will tell you that the actual mechanics are too complicated to boiled down into a talking point (especially when we consider psychology). The talking point is valid, but it is misleading if we don’t discuss the details. For instance, a person who spends their life being poor and gets rich quick may be likely to “hoard” for fear of going back to being poor. Those who get money after a recession exhibit this same trait (the Obama recovery, after the bailout of banks, is thought to show this, due to a propensity to save and other factors). We need to factor in charity given at the end of life and general changes in the propensity to save in later life, social security, investment income, job creation, and some other factors. On the flip side, those with less money, but a steady supply of money, will tend to spend most (if not all) of their income, and spend even more on credit. The low- and middle-classes are arguably overspending and under-saving right now. If a rich person spent 110% of their money, they would not longer be rich. People who overspend on credit are great for the economy today, but inevitably the debt they can’t make good on due to the money they didn’t save causes financial issues (for example the banking crisis that led to the bailout). Plus, people with lower incomes are often, if not always, directly or indirectly, working for the people with more money. One can spend all the money in their piggy bank, but debt, credit, and investment income need to be considered too. One could argue that we have a problem in America because some groups of people such as students are being pushed to overspend due to cultural influences. To what role is marketing, consumerism, subsidization, credit, debt, and questionable legislation playing a role? How about low return on investment for investing opportunities available to those with lower incomes. Bank savings returns and bonds aren’t attractive at the moment. BAD CREDIT & DEBT CONSOLIDATION: Bad Spending Habits, Living Above Your Means? This video points out one elephant in the room. Student loans would be another elephant. The repeal of Glass–Steagall Legislation is another elephant. The estate tax is another elephant. TIP: On the other end of the spectrum is the person hoarding who contributes nothing. The Kardashians and Hiltons at least, do “something”, but a chunk of the top 1% consists of those who do “nothing” (as far as contributing to society is concerned). When these people put their money “under the mattress” for enough generations, it has a very real effect on the economies of America and the world. To what extent should this be addressed, if at all, is one of many questions related to wealth inequality? If we look at saving versus spending over the span of a lifetime and therefore “wealth”, as in the study mentioned above done between the FED and Dartmouth (which looks at many other past studies), we find that lots of factors are in play. There is a lack of data pointing to “lifetime hoarding” as the only sticking point of the economy. If we only look at the today’s data, we will come away seeing how addressing income inequality helps the economy boom in the short term. But, if we consider a 70 year period rather than a single day, it becomes much less clear that this solution is subtle enough to address all the underlying issues. Tightening up loopholes or addressing income and wealth inequality still may be good or it may be disastrous. Economics are subtle, and absolutes are not subtle. With that in mind, I think this video from TedEd sums everything up well. Chrystia Freeland: The rise of the new global super-rich. This is where we were in 2013; it hasn’t gotten better. TIP: If you are still interested, you should read the Do the Rich Save More report or see our page on the velocity of money. In conclusion, “the rich save more”, but this is only one clue as to overarching problems and solutions. Remember the “top 1%” in America is 3.2 million Americans, painting them all with a broad brush, or trying to boil this down into too simple a talking point, is just asking for trouble. Ultimately, incentivizing some people to spend and others to save, and closing tax loopholes is likely the most healthy choice. The devil is, as they say, in the details. Why Do the Rich Save So Much?